Mint state (MS) and key date listed Three Cent Nickel values is for graded, certified and authenticated coins in PCGS or NGC holders. The rest are a sample of raw coin sell but this is not a guarantee your coin with the same date, mint, grade and holder will sell for this exact value. You can still buy common date Three Cent Nickels in lower grades and damaged condition for less than $10 but problem free and higher grades can fetch $15 to $200. Key dates sell for much more and this will depend on the survival rate and mintage of each date. The 1885 is the key date of this series and it’s value begins at $450, if problem free, and with a whole date. The other key or semi-key dates can fetch from $125 to $400 in the lower grades. G4 (Good) is a common grade for Three Cent Nickels and so is damaged coins, so it’s important to realize that coins selling for less than book value might have a problem – even if they have nice details. In G4 and AG3 (About Good) the common date Three Cent Nickels can sell for $5 to $10 each and key to semi-key dates can sell for $100 to $450 in the same grades (depending on the date). In AU (About Uncirculated) grades are all worth at least $90 and up for lower mintage dates. The 1885 in AU is worth around $1,400 and the 1870 is worth $90, as an example. In MS (Mint State) these Three Cent Nickels are worth $200 and up and that will depend on the grade, for example, MS60 is the lowest uncirculated grade and MS63 is worth more and MS64 is worth more than MS63, so on and so forth. Gem quality or coins that grade MS65 and up are going to realize $500 and up to $15,000 for the 1885, but these are valuable because they’re hard to find. You also have proof only dates and those are 1877 and 1886 and they’re worth $500 and up and all dates have a proof version and they’re worth $300 and up. Look for Doubled Die for obverse and reverse (DDO or DDR), Repunched Dates (RPD) and other anomalies since most will add some premium value, but die clashes are common and doesn’t add much value. 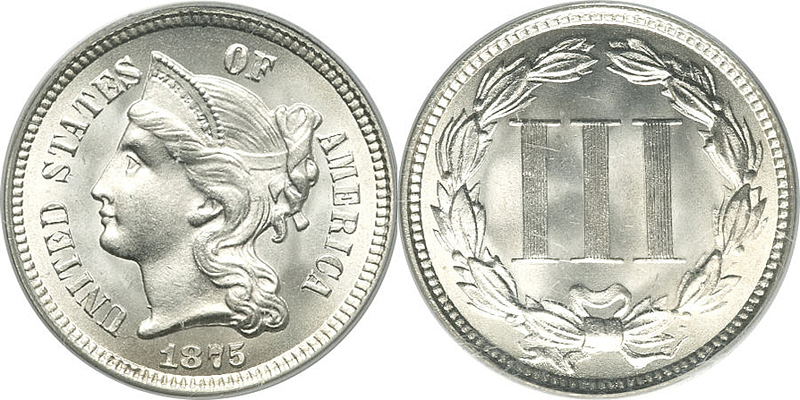 Three Cent Nickel value depends on grade, condition, mintage and if it's a variety.